On Saturday’s Huckabee show on FNC, host Mike Huckabee interviewed the former executive director of a Planned Parenthood clinic in Bryan Texas, Abby Johnson, who became a pro-life activist after witnessing an ultrasound of an abortion while she assisted in a procedure. She charged that the abortion provider tries to "increase the number of abortions they do" for the purpose of making money, and described the emotional experience of watching an unborn baby at 13 weeks pregnancy "trying to get away" as its life was being ended. Video of the interview can be found here. 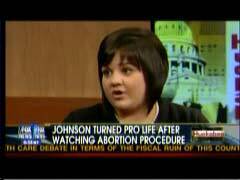 Johnson: "I saw the probe going into the woman's uterus. And at that moment, I saw the baby moving and trying to get away from the probe. ... And I thought, 'It's fighting for its life.' And I thought, 'It's life, I mean, it's alive.'" I just was thinking, "Oh, my gosh, make it stop." And then, all of a sudden, I mean, it was just over, just, in the blink of an eye. And I just saw the, I just saw the baby just literally, just crumble, and it was over. If clinic workers saw what was happening on that screen, they would be running out of those clinics. This is what the abortion industry does not want their workers to see. They don't want their workers to see what's actually happening during an abortion. That's why Planned Parenthood doesn't do, that's why so many of these large abortion industries don't do ultrasound-guided abortion procedures. They don't want people to see what's really happening in the woman's womb. MIKE HUCKABEE: Well, she helped numerous women get abortions, but she’s now a strong pro-life advocate who helps lead protests at the very clinic she once worked for. Please welcome former director for Planned Parenthood, Abby Johnson, from Bryan College Station, Texas. Abby, it’s so nice to have you here. HUCKABEE: We asked Planned Parenthood to issue a statement. We actually asked would they like to be on and share their side of the story. We got this statement – I want to share it. They said: "Planned Parenthood respects everyone's beliefs on this most personal of medical issues, and Planned Parenthood remains fully committed to ensuring that every woman facing an unintended pregnancy knows all of her options. Planned Parenthood’s focus is on prevention. Nationwide, more than 90 percent of the health care Planned Parenthood affiliates provides is preventative in nature." Abby, my honest assessment of that statement is they do prevent some things. They prevent birth, not illnesses. There’s no illness involved in a pregnancy. Illness means you're sick. You're not sick when you're having a baby. HUCKABEE: When you were at Planned Parenthood, did you find that the focus was on health care and prevention of illness? JOHNSON: No, it's prevention of, I mean, a lot of it is prevention of pregnancy. And that is why I got into it. JOHNSON: That’s why I first got involved. 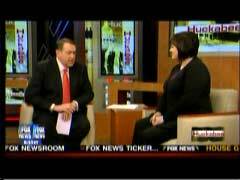 HUCKABEE: -to keep people from getting an unintended pregnancy. JOHNSON: That's right. That’s absolutely why I got involved in it. But I soon found that one of their goals was to make money. And the way they make money is to increase the number of abortions they do. HUCKABEE: You were working, actually, helping and assisting in an abortion, and you saw on an ultrasound of the abortion process. Tell me what did you see when the ultrasound was running and the abortion was taking place? JOHNSON: Well, I was called into the room to assist during a procedure. And it was actually an ultrasound-guided abortion procedure, which is not that common in Planned Parenthood health centers because it's a longer type of abortion procedure, and Planned Parenthood centers are trying to do as many procedures a day as they can, and so they’re not going to take a lot of time for each procedure. But for whatever reason, this physician did decide to do an ultrasound-guided procedure on this particular woman. And so, I was called in to help. And my job was to hold the ultrasound probe on this woman's abdomen so that the physician could actually see the uterus on the ultrasound screen. And when I looked at the screen, I saw a baby on the screen. And she was about 13 weeks pregnant at the time. And I saw a full side profile. So I saw face to feet on the ultrasound machine. And I saw the probe going into the woman's uterus. And at that moment, I saw the baby moving and trying to get away from the probe. HUCKABEE: Moving away from it, oh, my God. JOHNSON: Yes. And I thought, "It's fighting for its life." And I thought, "It’s life, I mean, it's alive." HUCKABEE: Until that moment, Abby, had it appeared to you that you were able to use words like "fetus" and "tissue," it's very different than when you saw the form of a child, recognizable. JOHNSON: That it was alive. Mm-hmm. HUCKABEE: What did you do? Did you say anything at that moment to the doctor? HUCKABEE: -and realized that what was underneath that hand once a moment ago was life and it's gone? HUCKABEE My gosh. When you were faced with that – by the way, did the woman see any of this? Did she have access to see the screen at all? JOHNSON: No, she was sedated. HUCKABEE: People never see really what’s happening to them. HUCKABEE: I can't help but believe if they saw that they might be running out of those clinics. JOHNSON: Yeah, absolutely. If clinic workers saw what was happening on that screen, they would be running out of those clinics. This is what the abortion industry does not want their workers to see. They don't want their workers to see what’s actually happening during an abortion. That's why Planned Parenthood doesn’t do, that's why so many of these large abortion industries don't do ultrasound-guided abortion procedures. They don't want people to see what’s really happening in the woman's womb. HUCKABEE: You know, I think about what you've gone through. You must have walked away that day saying, uh-oh, this is not what I want to be spending the rest of my life doing as a career. What was the next step you took? You were the executive director of that Planned Parenthood clinic, and yet, really you didn't know what was going on back in those back rooms in that standpoint. JOHNSON: Mm-hmm. I went home that day, and I had made the decision that day that that was it, and I went home, and I talked to my husband about it. And, I mean, my husband is a teacher. And we have a daughter, and so we're depending on two incomes, and so, we just decided that I would go back to work, and I would just be really looking for another job. And I knew that I had two weeks until we were going to be doing surgical abortions again. So I had two weeks to find another job. And so I went, the first week was pretty uneventful. And the next weekend came, and that Monday came, and I was just sitting in my office, and I was crying. I had the door closed. And I was just thinking, "Where am I going to go? What am I going to do? I don't want to be here." HUCKABEE: What did the people at the clinic say when you finally said, "This is it, I'm leaving"? JOHNSON: Well, nobody really knew what was happening. I couldn't talk to anybody at the clinic because they didn't know what was going on in my heart. They didn't understand what was happening. And now that they do know, Planned Parenthood has put a restraining order out on me now that they know I’m working with the pro-life movement. HUCKABEE: I wish Planned Parenthood would put a restraining order on themselves and stop the horrible procedures that they're doing every day. Abby Johnson, thank you. You have a lot of courage to share your remarkable story. And I thank you so much, and I hope it's a great reminder that we can't necessarily just listen to words. We need to understand the actions behind them. HUCKABEE Thank you. God bless you. What a wonderful story. JOHNSON: Thank you, thank you.